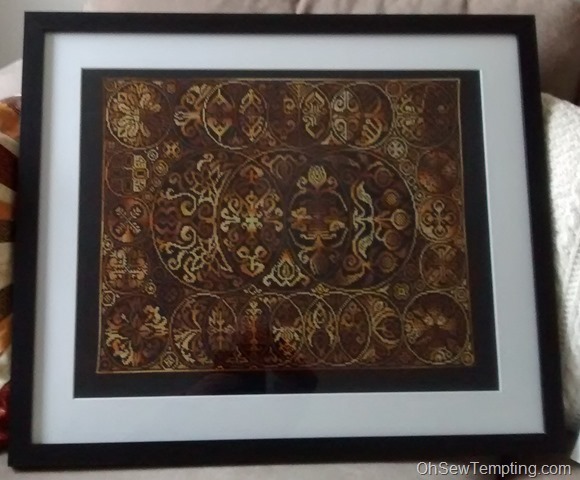 At last I’ve put these cross stitch projects into the frames. I’m always happy to frame my own pieces and usually buy custom sized frames but this time the quote came in way over my budget. I decided on some cheap and cheerful frames, not a perfect fit, but they’ll get my needlework out of the drawer and onto the walls in time for Santa’s visit. If you read this blog regularly, you’ll recognise all the projects. 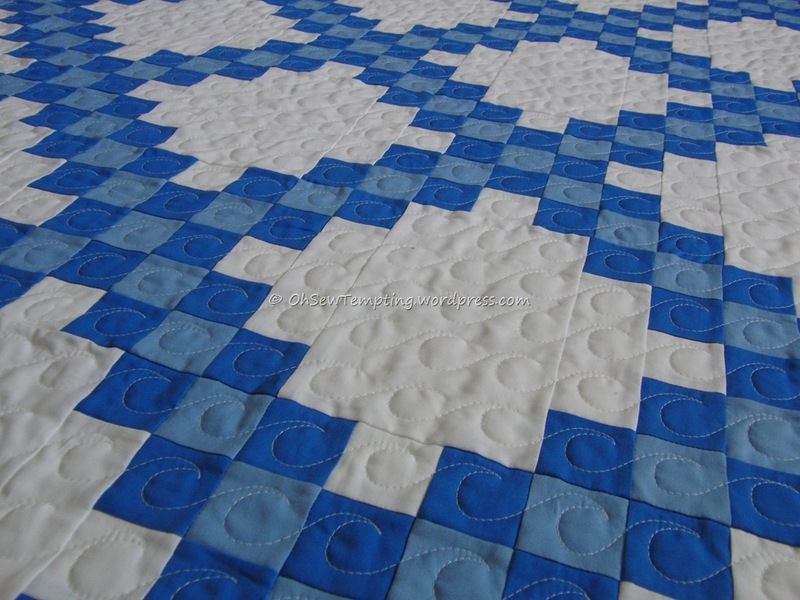 First up is the most recently finished one, Quilt V by Whispered by the Wind, though you will remember that I changed the blocks so much that it barely resembles the original. 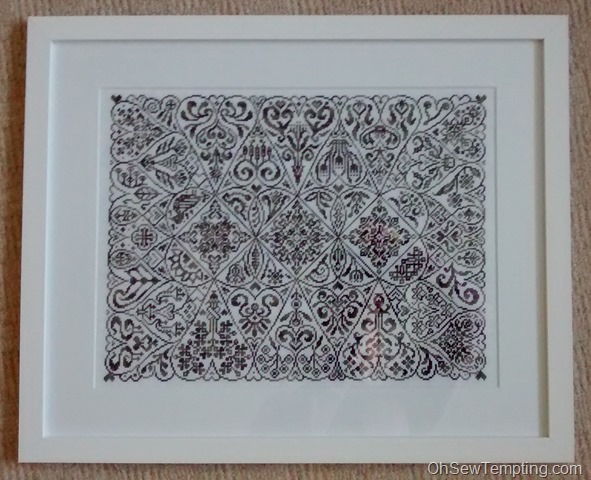 I chose a white frame and border, and because it’s an off-the-peg size, it isn’t perfect but it’ll do until I save up. Here it is in the frame. Claire and I both stitched this one as part of a SAL group. The next one is Cirque des Coeurs by Ink Circles. I think I only wrote one post about this one. It was completed while I was away on holiday in 2014. You can see lots of close up detail and watch it grow here. Claire gave me the idea for the thread choice and I love it! 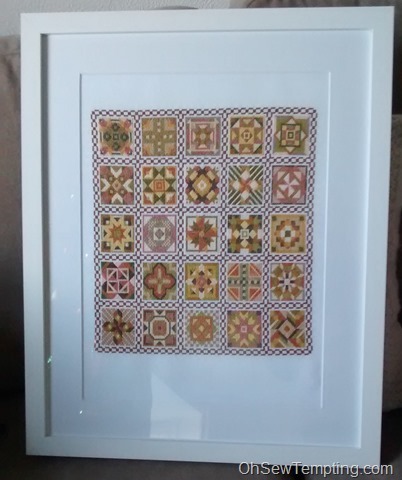 I decided on a crisp white border and frame again. This time, it’s a perfect fit. Finally, another Ink Circles one. It’s called Cirque des Cercles. I made it in the suggested thread on black evenweave. I had originally chosen a black frame and border for this one but they sent me a white border by mistake. I was in two minds about sending it back but I think they must have known what I had in mind to frame. All black would have been too much I think. I’m very happy with the white and I’m pleased I thought about it and tried the piece in the frame before asking for a colour swap. 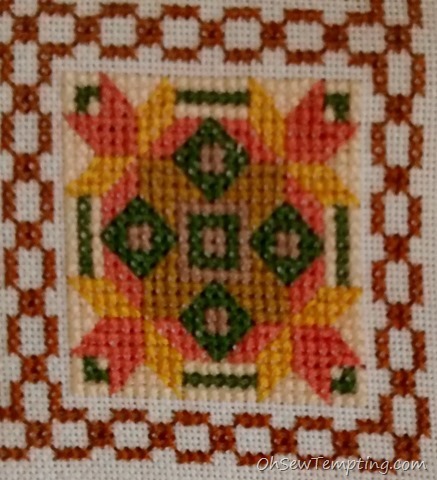 I stitched this one as part of the SAL with Claire as well. I’ve been making a little birthday present for my Great Niece. Her birthday isn’t until next month but I like to be organised you know. 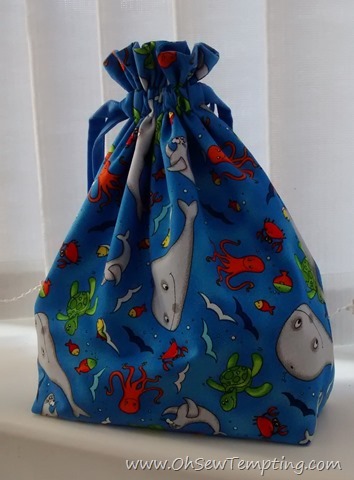 It’s a very simple, lined drawstring bag. I absolutely adore this fabric. I bought it just after my Great Niece was born and always had in mind that one day I’d make her a bag from it. Soon she will be four years old. Those turtles are so cute! 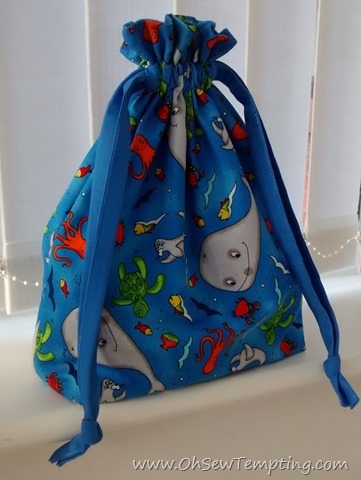 I lined it with the same solid blue as I made the drawstrings from and it has a box shaped base so it’ll stand up on its own. I’ve got a finish to show you that I’ve been working on for a while. 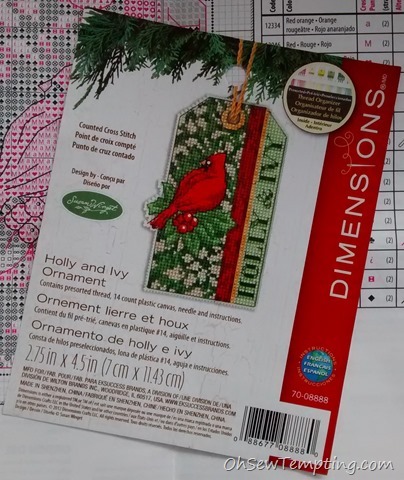 My lovely friend Claire sent me this kit all the way from France. She’s so kind 🙂 I’ve had it for a while and I just fancied making something small for a change so it was the perfect choice. It’s actually quite stitch intensive but I found it so easy to pick up for just a few minutes here and there. What crafty item do you have that you have never used and how long have you it? 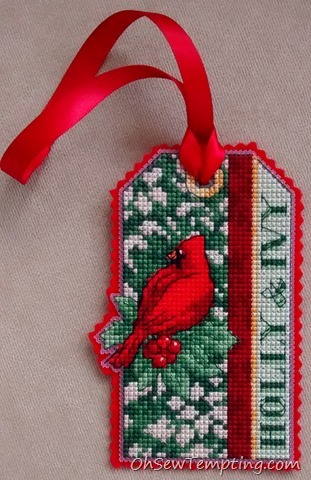 Posted in 2015, Cross stitch, Decorations, Finished! I have a finished piece to show you today WOOHOO! Both me and Claire have finished the Friendship Quilt V by Whispered by the Wind, though both of us have significantly changed the original design. That means we have something unique. 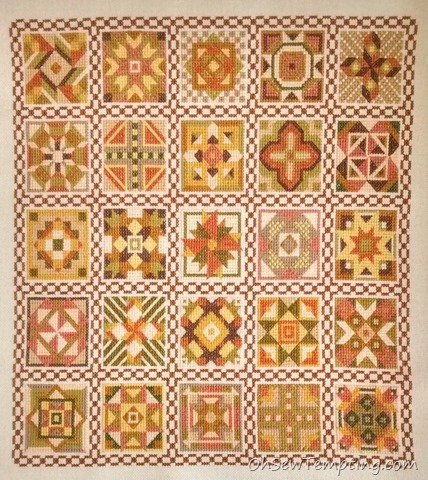 You will remember that last time I shared an update I had completed 23 of the 25 blocks. Here is block 24. So, at last it is done! Next time we’ll be revealing the first stage of our new project. Me and Claire are doing the same project again. I’m so excited to be starting something new and colourful at last. Please visit the other blogs in the group. Most of us are posting updates some time today and there are many gorgeous projects to enjoy. Simply click on the names below. Claire, Gun, Carole, Jule, Wendy, LucyAnn, Kate, Cathy, Jess, Jacqui. Our next group update will be on 15th November. See you then! Just a few words and a photo of my latest finish by Bothy Threads. 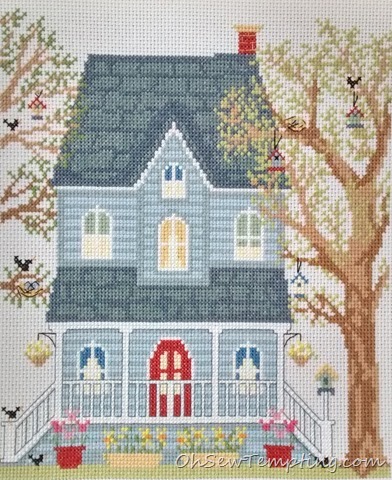 It is part of a series of four New England houses, one for each season and this one is for Spring. 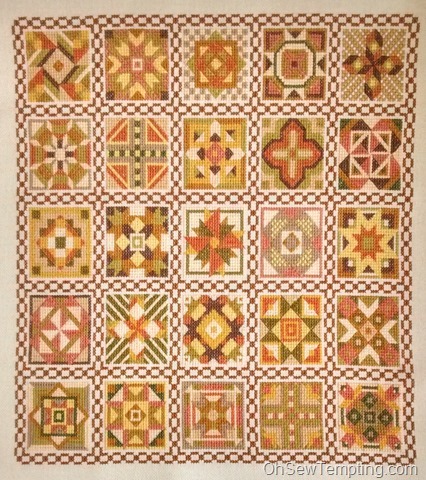 I really enjoyed stitching it and hope to get it in a frame very soon. In case you know this design, I omitted the weather vane on the roof because I wasn’t keen on it. Typical eh? I’ve just started a new sampler by Design Works called ABC Bears and I’ll show you progress when I’ve finished the letter A. 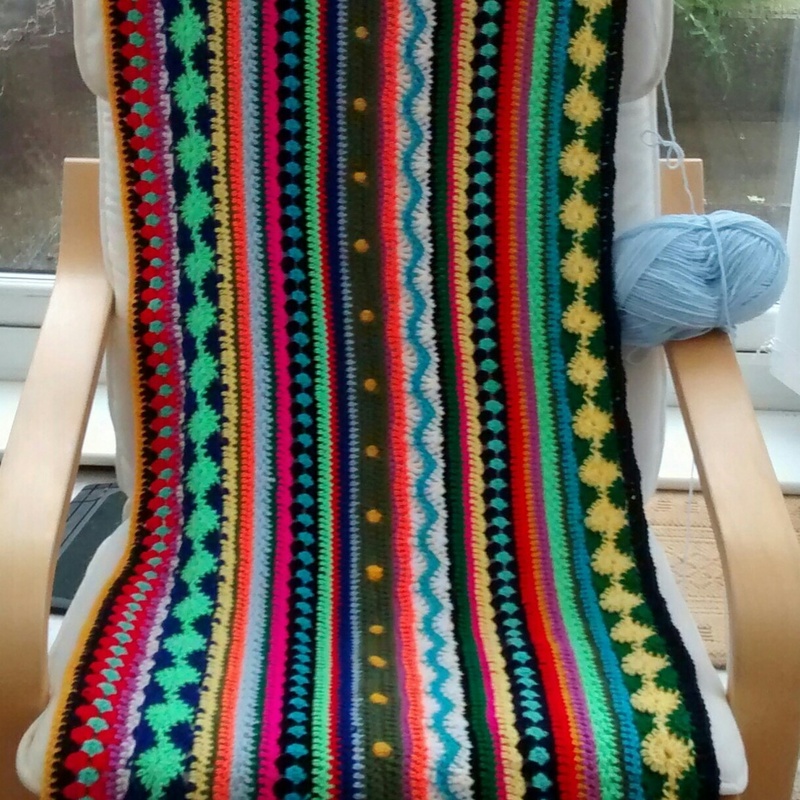 Do you remember this blanket that I started to crochet using a load of brightly coloured left over yarn from a previous project? 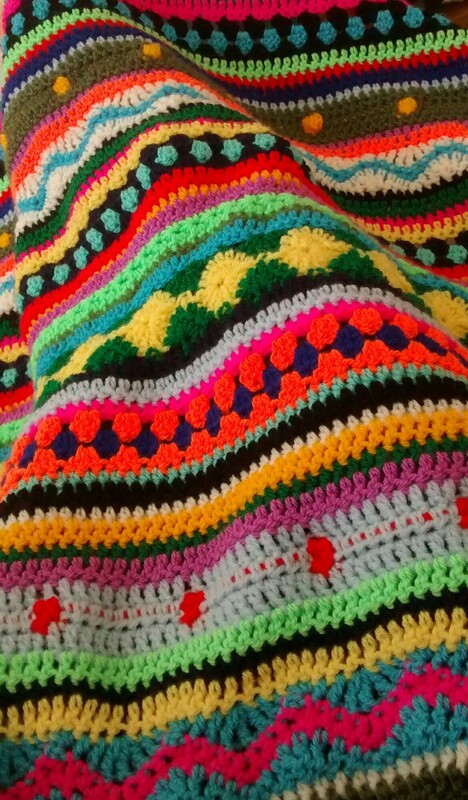 This is me snuggling underneath it while I crocheted more and more and more. Thank goodness it’s been a cool summer so far. I promise you it is a perfect rectangle in real life and it didn’t need to be blocked either. I had to climb to the very top of the step ladders and hold the camera against the ceiling to take this photo. I still couldn’t fit it all in properly. With the side of my face pinned to the ceiling, it took a few clicks to get this photo. I couldn’t really see what I was taking and this one is the best of a bad bunch! I finished the edges with black, then turquoise, then black again and I’m happy with the way it turned out. Now, credit where credit is due. The free pattern is from Not Your Average Crochet. It’s called the As-We-Go Stripey Blanket. I used the pdf version with the photos. 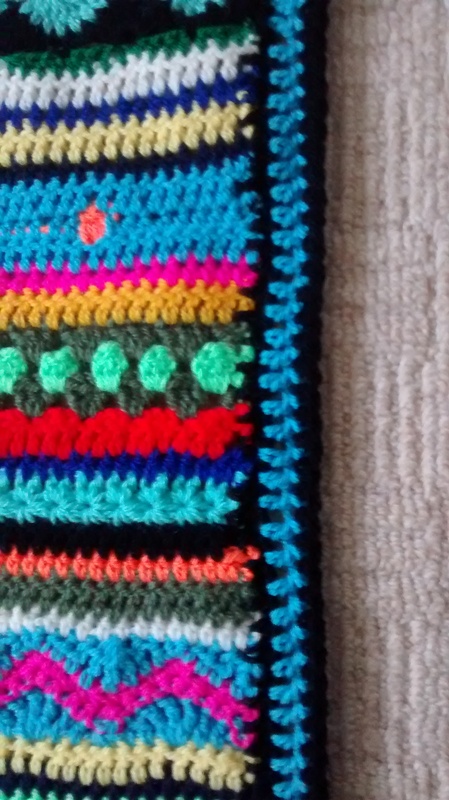 I’m in no way an expert at crochet and the photos plus a couple of Youtube videos helped a lot. 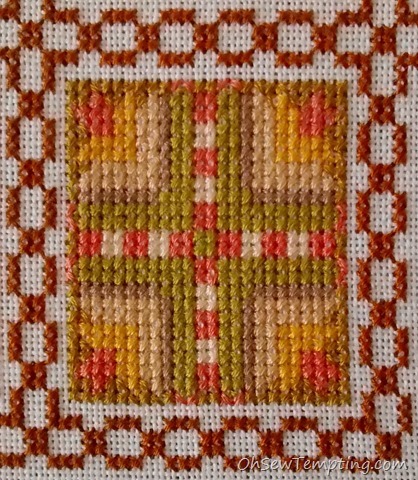 I’m so grateful to Hannah for sharing her pattern for free and I’ve learned lots of new stitches from her along the way. 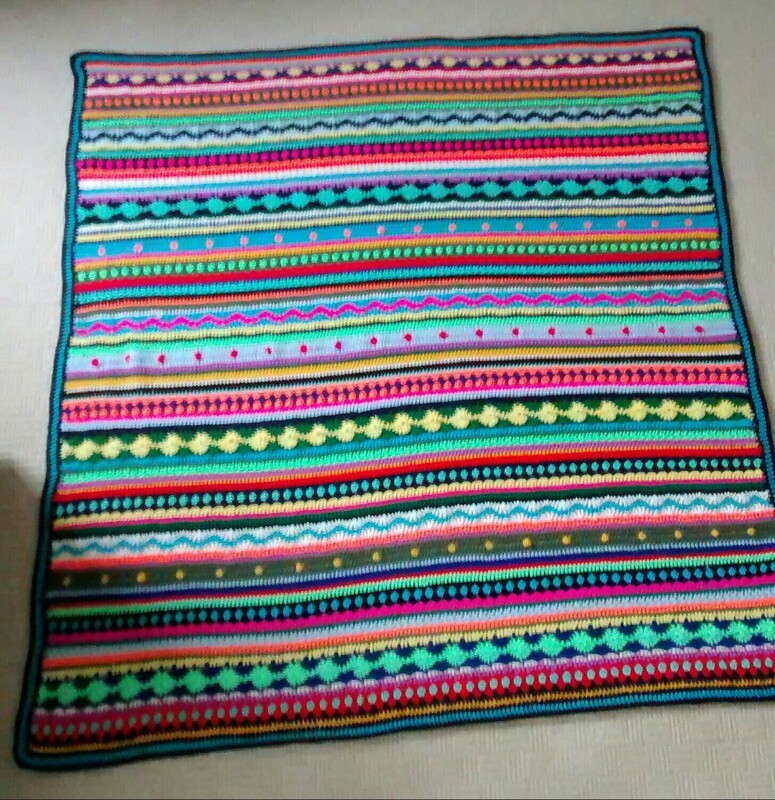 If you want to see more versions of this blanket in different colour ways (I appreciate that my ever so bright colour choice won’t suit everyone), you’ll find lots to inspire you in Google images. Go on, have a go at making one of your own.